"Passion and purpose" are two words every member holds dear at the Rotary Club of Windsor (1918). We welcome new members to catch the inspiration that has fuelled so many of us to become Rotarians, and motivates us to continue to reach out to Windsor and to communities all around the world. There is strength in numbers, you're invited to help us make the world a better place. As one of the largest and most effective humanitarian organizations in the world, becoming a Rotarian means that you are part of a local network of professionals with a global reach. In the words of a member: "I have enhanced my own life through the opportunity to help others." Social standing, wealth, race, gender, religion and politics are not criteria for membership consideration; but the desire and ability to serve, and to meet the club's attendance requirements for its weekly meetings, are important considerations of the membership committee. In addition, a prospective member must either live or work within the territorial limits of the club or an adjoining club, or within the corporate limits of the city in which the club is located. 1. Fellowship with people having similar ideals, including the desire to help others. 2. The feeling of satisfaction gained through participating in unique community and international service projects, improving your vocation, and developing international friendships. 3. The privilege of wearing the unique Rotary lapel pin, which identifies you as a member of a select group of men and women who attend to human needs along the pathway to peace. 4. A broadened acquaintance with leaders of other businesses and professions. 5. Participation in stimulating and informative programs at the club's weekly meetings. 6. Opportunities to form friendships with Rotarians of other clubs in nearby communities or around the world when attending other Rotary club meetings to make up for missing your own. 7. Opportunities to learn about other cultures as you host people from other countries in your home and club--Rotarians, or non-Rotarians who participate in the programs of Rotary and The Rotary Foundation--or are a guest of Rotarians abroad through Rotary homestay, friendship exchange and other programs. l. Attendance. Rotarians must attend weekly club meetings. Rotarians who are absent four consecutive times, without making up for missed meetings by attending meetings of other Rotary clubs, or who attend less than 60 percent of the meetings during either six-month period of the club's fiscal year, will have their memberships automatically terminated (unless absences have been excused by the club's board of directors). 2. Proposing new members. It is a privilege and obligation of every Rotarian to propose new members. 3. Service on committees. To promote the ideal of service, Rotarians should be active on the committees to which they have been appointed by the club president. Such committees may fulfil internal club functions, or conduct the service and other activities of the club. 4. 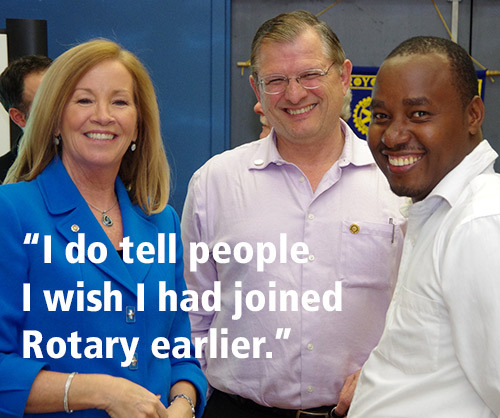 Continue learning about Rotary and the opportunities for service. Attend the district conference, an annual meeting of the district's Rotarians, that provides fellowship and discusses the affairs of clubs and Rotary International. Also attend an international convention to gain a true understanding of Rotary's internationality and the many ways in which Rotarians carry out international service projects. Future annual conventions will be held--beginning with 1994--in Taiwan, China; France; Canada; Scotland; and the United States. 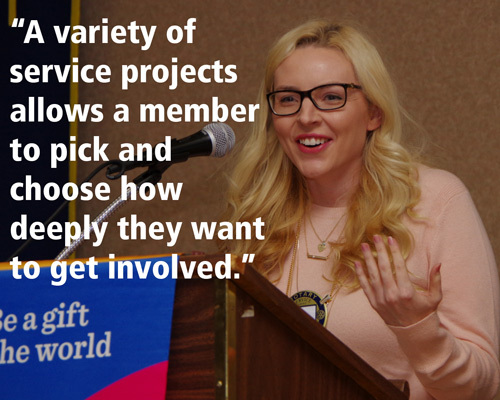 In most instances, a person being considered for membership is invited by a member/sponsor to attend one or more club meetings so that the prospective member can learn more about Rotary and meet the club's officers. The sponsor may then submit the name of the candidate for membership to the membership committee, which will review the candidate's qualifications and, if it chooses, forward the name to the club's board of directors for approval.